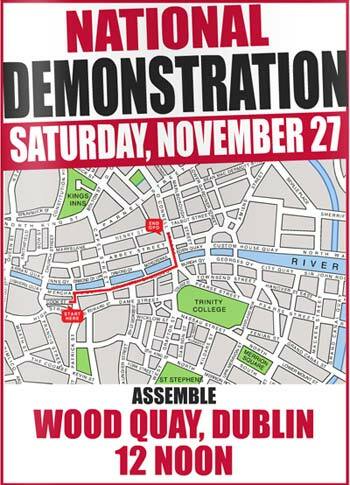 3 responses to "National Demonstration, Saturday Nov 27"
Thanks for this enlightened post. People of Ireland, please, please, wake up. I agree with your comment about the parliamentary opposition: “Fact is, they don’t have an alternative plan and are completely devoid of ideas and vision.” In the parliamentary system we have three middle-road parties all sharing the same mediocre lack of vision. I am sorry to say that I think this reflects Irish society’s general lack of vision. As Proverbs 29:18 sayeth, Where there is no vision, the people perish. The word “bailout” is constantly being used in the media, but that somehow implies we’re being helped. Precisely the opposite is the case. Some estimates suggest the total debt is close to €250 billion. That puts us in hock to the ECB and IMF for a couple of generations. Few if any of the people involved in the negotiation of this debt-transfer will be alive when the money is finally paid back. I keep having to say that out loud to prove I’m not going mad… that the words really do make sense. Let the bloody banks topple. Force the ECB bail them out directly if they feel so strongly about it. No reason for the Irish people to act as go-between. It seems to me that the injustice of this intervention is such that we have a moral imperative to resist and reject it.